Yesterday I read The Future of Enterprise Software Will be Fun and Productive by Michael Wu, Principal Scientist at Lithium and a gamification guru. He focused on “adoption” as the key metric to improve in his example of CRM, his example of an enterprise app (understandably so, since Lithium’s primary product is a social CRM application). And the key question he asked was how can we use game mechanics to make social CRM more fun, and therefore achieve better adoption? If gamification has so many benefits, why wasn’t enterprise software gamified? I hate to speculate, but I suspect that one of the reasons is that fun was never a requirement for enterprise software. Early software architects simply did not understand that fun and adoption go hand in hand. If you make it fun, people will use it. If you truly believe enterprise software can boost productivity (if used properly), then fun becomes a requirement for productivity, since adoption is clearly a prerequisite for realizing the productivity gain from using the software. Now, I have a quibble with Wu’s approach. In particular, I disagree that enterprise software has to be fun to boost productivity (or adoption). I prefer to focus on the sense of engagement, for several reasons. First, lots of things we like to do are not fun, but they are engaging. For example, cooking. Making art. And exercising. These are fun (sometimes) as a side effect, but what keeps you going in any of these activities, and keeps you coming back and improving your skills (or fitness), is not fun, per se. Getting back to enterprise software, I work from the fundamental assumption that the people working with my application want to do a good job, and they are willing to put up with some pain and inconvenience to do so – they will come to work, they will work with the prescribed software, they will go their meetings, they will collaborate with people whom they might not want to socialize with in the best of all possible worlds. So, people are already giving us providers of enterprise software a giant leg-up on getting them engaged – they’ve committed to be there, they’re probably interested in the subject (that’s part of how they got the job) which provides intrinsic motivation, and they have extrinsic motivation to do their job (that is, their paycheck). The first thing we can do with our enterprise apps is get out of the way of this intrinsic (and extrinsic) motivation to do a good job. If the app makes it harder to do a good job, for whatever reason, it’s going to cause problems not only for the user, but for the business as well. Lack of flow – this is related to the previous example, but is specifically about the fact that most enterprise software is not designed to help its users achieve a state of flow, even for a single process. Some of these obstacles can be solved just with “good design,” while others are very amenable to game mechanics and what I call socialification – a set of mechanics related to gamification but focused on social aspects such as presence, guru ratings, and feedback. In the next installments of this long article, we’ll describe an enterprise app that makes a perfect target for gamification, and then we’ll start from Gabe Zichermann’s six rules of gamification and take a stab at defining a gamified version of that app. What you say about fun is right on. 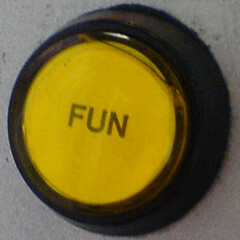 Fun is a tricky concept for enterprise as it sounds like the users need to enjoy themselves, when this is often a misleading representation of the user's expectation. User's are mostly looking for a way to be better enabled in the jobs that they need to do. Enterprise applications should be fun at least to the extent that a dishwasher is fun–I mean, it's not something you use because you can't wait to get home and do the dishes, but compared to washing by hand, it starts to seem pretty awesome. The problem with even this kind of "fun" is that in the enterprise world it hasn't been about providing a good experience, usually just providing a space in which to get a job done was of enough value to users that they would put up with all kinds of usability pains that you very aptly list in "Where's the Problem." Things are changing though, people expect more from there enterprise applications–they want it to enable them not only to do their job, but to do their job better, faster, and with greater ease. The sense of being properly enabled to do a job is constantly and rapidly evolving as technology moves forward. Let's run with the dishwasher metaphor for a bit longer and say that just cleaning the dishes is just sooo last century. These days, people might want a dishwasher that tells how to organize all the dishes inside and maybe a glass front so they can see exactly what's going on in there while it generates a live updating progress chart on your kitchen dashboard of course, and they want all this in a machine that's eco-friendly. Then if you can sprinkle in a little socialification and build a dishwasher that tracks how much water they are saving compared to the neighbors, you're really on your way to a fun product.